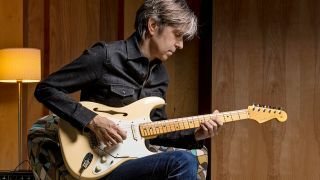 Eric Johnson seems to be enjoying a bit of a musical renaissance. He’s exploring new sonic avenues with a new signature Thinline Stratocaster even as he once again tours the album that really ‘broke’ him as a major force in guitar, Ah Via Musicom, released in 1990. But well before that, he’d upset the applecart of the American session world with his precise yet progressive, melodic guitar work that stood in contrast to the urbane stylings of Larry Carlton and other giants of that scene. His solo on Minstrel Gigolo by Christopher Cross in 1979, for example, is a little jewel - whose geometrically perfect construction still glitters with invention. Virtuosic yet deeply melodic and widely imitated, Johnson went on to introduce an abundance of distinctive licks to the lexicon of electric guitar and became famous - arguably infamous - for his exacting approach to tone, his playing representing a new frontier in instrumental melodic and blues guitar technique. Three decades and 10 albums on, Johnson cuts a more a mellow, thoughtful figure than that earlier reputation might suggest. His recent work, including last year’s Collage long-player, has seen him weave jazz deeper into his work and revealed him as a fine fingerstyle acoustic player who seems to be discovering yet more about the possibilities of the instrument as the years pass, rather than subside into musical complacency. You play acoustic beautifully on your latest album, Collage. Do you find playing unplugged liberating, given that your electric style is so well defined and pretty widely imitated? Do you ever like to play electric fingerstyle? “Yes and in fact it’s interesting because when I just play with my fingers, I think, ‘Well, that sounds great.’ I mean, you have great players like Jeff Beck, and Derek Trucks... I don’t think he uses a pick. There are a lot of people that don’t use them: Wes Montgomery, you know? Even at high volumes, I think it’s interesting. “There’s a certain thing a pick does which is why I still enjoy using it, but I love the fact that Jeff doesn’t use a pick, because it’s amazing. I sometimes wish that he would, 15 per cent of the time, use a pick - because there’s a certain thing he does with a pick that’s great, too. But I can see why somebody would devote themselves to a certain way to do things, because it takes so much time and dedication to get it together. “Yes, well, I think I’m trying to learn to put more emphasis on different beat patterns with rhythm, and that’s what I was trying to do on that song. Instead of just playing on the one, and just playing chords... You know, if you have other stuff going on in the sound, it can be a very interesting counterpoint. 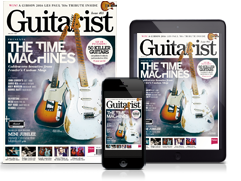 Do you think guitar music has recalibrated a bit towards serving the song rather than envelope-pushing technique? “Well, I think it [technical guitar] took its natural course and people got fed up with that. It became some kind of ‘sports’ thing, and as soon as you do that, it’s just a matter of time before it’s going to burn out. People get fed up with it, because it really devalued it to be this gratuitous thing. “I just think it’s progressing in a different way now. I think the approach to guitar is more to serve the music now. Somebody would have to totally reinvent the way we approach the guitar as a lead instrument to really turn people’s heads these days, because they’ve heard the same licks over and over for 60 years. “Originally, when the explosion of great guitarists happened, I think there was more of an adherence to serving the song. If you listen to Paul Kossoff in Free, or Jeff Beck with Rod Stewart, or Hendrix, definitely there was this amazing musicality, but it was infused into this overview of just great music. “I’ve seen YouTube videos of myself where I’m going on and on and on with lead solos, and it’s like: ‘Okay, wrap it up! That was interesting for a minute,’ but it’s, like, over and over and over... and I’m trying to look at that now. If you’re going to do that, it should be musical and melodic and take you on a journey, and maybe have something unique about it. You’re famously meticulous with regard to tone. What’s your rig like at the moment? “Well, right now, we’re doing a retrospective tour of Ah Via Musicom. It’s a really fun tour. It’s interesting: when I decided to do this tour and I started rehearsing for it I had to go back. I wanted to really play the music note for note - but I was noticing I was having a little trouble getting the sound. “So I started listening to some of the sounds I was getting now, compared to 25 years ago, and I noticed there was a certain harmonic thing [missing]. I would start to listen and go, ‘Wow, I had this incredible amount of gain and it has a sort of a ferocity to it that maybe I need to reintroduce into what I’m doing in the present.’ So, I ended up going back to a lot of the gear I used back then. “So, right now, I’m using a lot of older gear that I used back then, and it’s brought back some of the aspects of the sound I had back in that period that I’m really glad to get back, so I’m trying to do a hybrid of whatever I’m trying to do now, plus some of the aspects of that I did before. There’s quite a trend now for amps with serious clean headroom that are intended to have drive pedals in front of them - do you like that approach? “Yes, definitely. I mean, if I had one amp I had to use and that was it, it would have to be the Twin Reverb. The whole concept of a solo sound that I like to get, and the rhythm sound I like to get... they’re diametrically opposed to each other. So I’ve always had to use two amps. “The way a Marshall is designed is more like a Tweed amp, in terms of where they put the tone stack and the preamp. It’s a totally different approach than, say, the 60s Blackface thing, which is more of a [high] headroom sound. “They’re both viable, because I wanted to be able to get that The Wind Cries Mary tone, but then I also wanted to get the Wheels Of Fire Cream tone and I never was able to reconcile how I could do it out of one amplifier. I tried doing it with pedals in front of the Twin, and I guess you could do that. But it ended up so that I needed to use both amps, because you also set the knobs different. Do you have any advice on getting the most, tonally, from pedalboards? “If I’m using pedals, obviously I want to use something that I like the way it works. You know, a chorus pedal that sounds good, or an echo or an overdrive. Just simple things that I like. “Where somebody can get in trouble is that there are so many pedals and a lot of them do all these neat things. But, to me, what’s even more important is what does it do to your direct tone? Some pedals have this awesome effected sound, but they compromise your direct tone. Unless you use a wet/dry rig... but that has its own problems, too. “So, in fact, I don’t use a wet/dry rig. What’s most important to me, though, is whether the pedal destroys my direct tone. Because at that point, I don’t care how great the effect is, it’s useless to me - because I’ve lost the natural beauty of the guitar tone. What was it like to revisit Ah Via Musicom? Did you feel a strong sense of contrast between the player you were back then and how you are now?